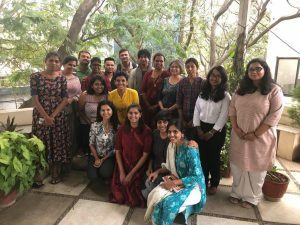 On 21.11.2018, the Centre for Law and Policy Research, Bengaluru organised a one-day consultation with the transgender community, civil society organisations and activists to discuss the preliminary findings of our study on intersectional discrimination. CLPR conducted a qualitative and quantitative study, in the form of interviews and surveys, respectively across the four South Indian states of Kerala, Karnataka, Andhra Pradesh and Tamil Nadu. The study focuses on caste discrimination faced by women, transgender persons, and persons with disabilities. A preliminary report was presented by J. Mandakini and Saumya Dadoo. A pdf file of the preliminary findings can be accessed in the “Resources” section of this post. 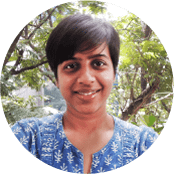 Qualitative interviews with women from Scheduled Castes (SC)/Scheduled Tribes (ST) revealed that they were treated differently, on the basis of their socio-economic status. They were also victims of paternalistic attitudes of male members of the SC/ST community. CLPR also found that the prospect of marriage affects SC/ST men and women with disability differently. 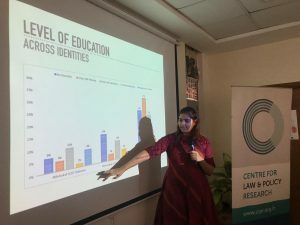 A key finding of the quantitative research was that only 37% of SC/ST persons with disabilities had received formal education until primary classes, of which only 10% were cisgender women. This is indicative of differential treatment on the basis of gender identity within SC/ST persons with disability. CLPR also studied differential treatment within the same caste group. Most SC/ST women, men with disabilities, and transgender persons attributed it to their gender, disability, and gender identity, respectively. This provides evidence of discrimination occurring within the same caste group. CLPR witnessed wide-ranging discussions on these issues. A more concrete draft of the findings is scheduled to be released shortly.